Chentai Filter Paper supply Automotive Light Duty Filter Paper, Vehicle Heavy Duty Filter Paper and Industrial Filter Media, such as Gas Turbine Air-Intake Filter Media, Dust Collector Air Filter Media, Air Filter Paper, Oil Filter Paper, Fuel Filter Paper, Cabin Filter Media, Nanofiber filter media. 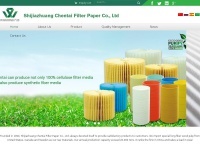 Keywords: China Chentai Industrial Dust Collector Air Filter Media Paper Automotive Paper. three profiles were found for Chentai.net in social networks. Among other social networks the website is represented in Facebook, Twitter and LinkedIn. The web server used by Chentai.net is located near the city of San Jose, USA and is run by Peg Tech. The website Chentai.net has a own web server. The web server only runs this website. The websites of Chentai.net are served by a Apache server. The markup language of the website is XHTML 1.0 Transitional. The website does not specify details about the inclusion of its content in search engines. For this reason the content will be included by search engines.